It is in the city of Aleppo in Syria, that the Aleppo soap was born 3 000 years ago, made of local products. It was the Crusaders who brought back the Aleppo soap to the West during the Middle Ages. Aleppo soap is the ancestor of Marseille soap and all today’s solid soaps. The quantity of laurel oil correspond to the percentage of laurel compared to the oils total. 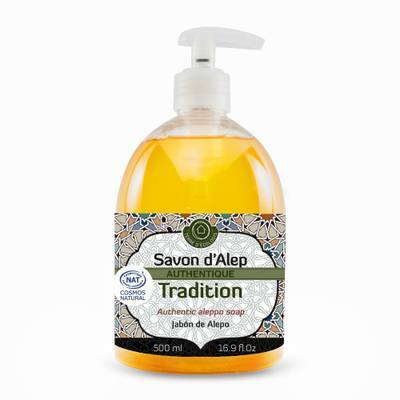 Authentic liquid Aleppo soap 15% is destined to the daily cleansing. Its creamy texture easily melts and produces a light moss. It is suitable for normal & sensitive skins. This soap has been made by the Master soap maker of Aleppo, Mr. HARASTANI.